Suspended in a valley in the mountains of the island, the radio telescope was built-in 1963 by Cornell University and the National Science Foundation. After considering Hawaii, Mexico, Cuba and some smaller islands in the Caribbean, Arecibo, Puerto Rico was selected as the ideal place because of its proximity to the equator. In addition, the radio telescope needed to be far away from any large population centers, so the radio waves produced in cities wouldn’t interfere with operations. Keeping this telescope within US territory was a must because of its military uses. Arecibo telescope with 350 meters diameter, is used for aeronomy, the study of the upper atmosphere and allows objects that are too far away in space to be observed by radio waves. Astronomers have used this instrument to detect radio emissions from distant regions of the universe, enabling them to measure distances and masses of galaxies. 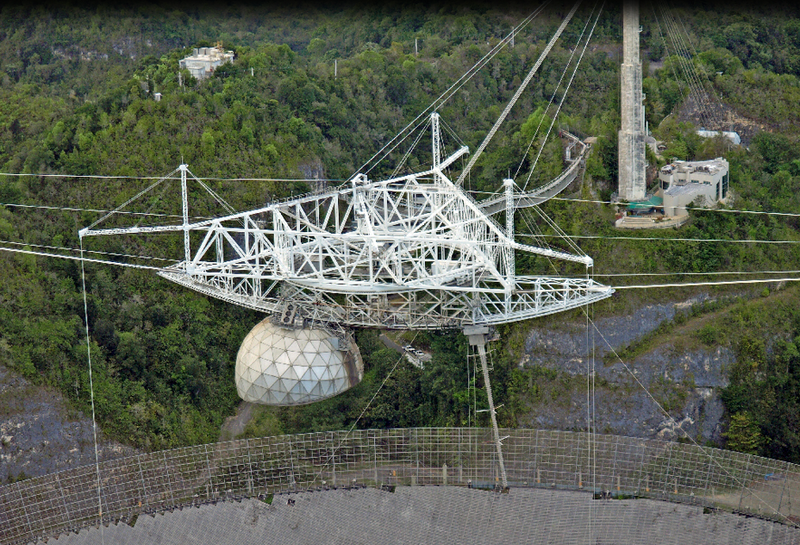 There have been significant discoveries at the Arecibo Observatory over the years. Among them, right after the observatory was opened, it became clear that the rotation of Mercury was 59 days, instead of 88. The first planets outside of our solar system were also discovered using the Arecibo telescope in 1994 and it has also enriched our knowledge of pulsars. 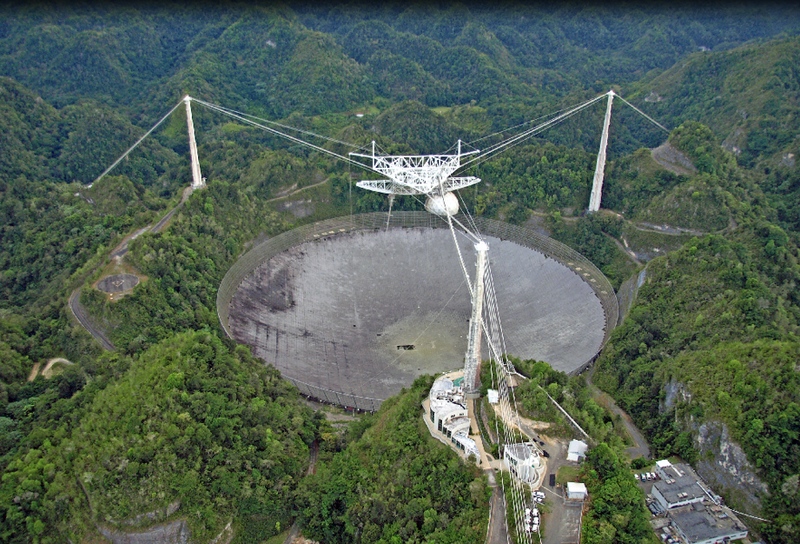 Known as the search for extra-terrestrial intelligence, SETI is the most famous research project at Arecibo Observatory. Just like in the movie Contact with Jodie Foster that was based on the novel by Carl Sagan and was filmed there, astronomers send radio signals out into space, hoping to contact extraterrestrials. Even though the future of this observatory is not certain due to funds, in the last few years, astronomers have worried about an asteroid hitting the earth and destroying humanity. To observe asteroids, it has been determined that Arecibo Observatory is the ideal radio instrument. For the past 53 years, this advanced dish allows astronomers to keep discovering specific data about our universe. In 2016, China’s new telescope FAST will surpass Arecibo Observatory with a 500 meter diameter. Time seems to be moving faster as the universe is shifting. So, which other significant discoveries could take place within the next three years? Why is Puerto Rico known as a key place for extra-terrestrial activity? Will scientists be able to discover what is really dark energy? And even prove that while our days seem to be getting shorter, time is just an illusion? This entry was posted in Best places for and tagged aeronomy, Arecibo Observatory, asteroid, Contact with Jodie Foster, extra-terrestrials, SETI, world largest radio telescope. Bookmark the permalink.